How are we trying to control marine pests? The National System aims to prevent new marine pests arriving, respond when a new pest does arrive and minimise the spread and impact of pests already established in Australia. To help prevent the spread of marine pests, it is very important that vessels are well maintained and that biofouling is minimised. To look at control methods we will use the Northern Pacific seastar as an example. Currently the northern Pacific seastar is only found in Tasmanian and Victorian waters but it could spread along most of the southern Australian coast from Albany to Eden where it could cause major problems for local communities and commercial shellfish operations. To stop the spread of seastars between Australian ports, scientists are calculating the best time and place to collect ballast water, to minimise the uptake of young seastars. Shellfish farmers also need to be careful because they often move ropes and trays used for growing mussels and oysters between bays and estuaries to improve condition of the shellfish. Juvenile seastars spend the first three months of their lives swimming before they finally settle to the sea floor. But they can also settle onto mussel ropes and oyster trays. The trays could be submerged briefly in freshwater to kill the seastars (it would not harm the shellfish) but this is not yet common practice among shellfish farmers. Internationally, there are attempts to 'sterilise' ballast water so stowaways are not transported around the globe. It would be impractical to use chemicals because of the huge volume of ballast water carried on a single vessel. Ballast water systems are also being modified to prevent uptake (e.g. screens) or kill (e.g. heating, ozonation) stowaways in transit. In Australia, BHP modified its vessel, Iron Whyalla, to pump ballast waters through the engine to raise temperatures and kill seastars. Although these trials are promising, none of them are being used commercially. A more practical solution may be to exchange ballast waters, which are collected in foreign ports, in the open ocean. Marine organisms from open oceanic waters probably won't survive if they are dumped into coastal bays and harbours. To protect Australian harbours, the Australian Quarantine and Inspection Service (AQIS) is urging vessels to undertake voluntary ballast water management protocols, including exchanging ballast waters in the open ocean, when it is safe to do so. These measures will not reduce the numbers of seastars already in Australian waters. In 1993, community dives pulled 30,000 seastars from the Derwent but this hardly made a dent in the population. 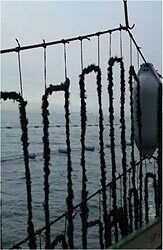 To protect commercial shellfish leases, specially designed traps are used. 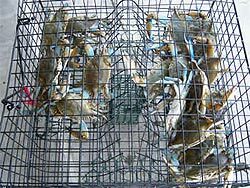 They are similar to lobster traps and are baited with fish scraps. But traps cannot catch all the seastars in Australian waters. Dredging could collect more seastars at once but would disturb natural marine plants and animals as well as resuspend heavy metals in the sediments. Disposing of large numbers of seastars carcasses would also be a problem. Seastars can be composted and used as mulch but 30 million seastar corpses would stretch even the largest compost facility. So, collecting seastars may be useful in sensitive areas (like marine farms or marine reserves) but is probably not practical or possible for all of the northern Pacific seastars in Australian waters. A financial reward would provide an incentive to hunt the seastars. In China, seastars are sold in markets for about $1US each but there is unlikely to be a demand in Australia for these as a gourmet food. 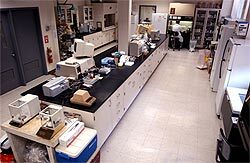 Pharmaceutical companies will not be harvesting the seastars because no bioactive compounds have been found in them. The northern Pacific seastar could replace seastars pulled from overseas reefs and then dried, painted and sold in interior decorating shops in Australia. This would help to protect seastars overseas as well as providing a cottage industry in Australia. At present, however, there is little financial incentive for people to hunt northern Pacific seastars in Australian waters. The problem with available seastar poisons (e.g. quicklime) is that they are not specific and, in the ocean, could damage natural marine communities. Also, the amount of chemicals needed to poison seastars in estuaries would be very expensive (and impractical). If poison baits could be designed which are attractive to seastars (and not local animals) they could be placed strategically to reduce seastar numbers. But as yet, no such bait has been found. Parasites, on the other hand, tend to search specifically for seastars and attack them. In Australia, northern Pacific seastars don't have parasites (which probably allows them to flourish). In Japan, northern Pacific seastars are attacked by a tiny single-celled animal – Orchitophrya stellarum. Orchitophrya stellarum invades the testes, eats sperm and castrates the seastar. Scientists hoped this parasites would control northern Pacific seastars in Australia - the perfect biological control agent. Unfortunately seastars have 10 testes and the parasite does not usually invade all of them. That means infected male seastars could still produce millions of sperm to fertilise eggs. Therefore, it's unlikely Orchitophrya will have the effect scientists had hoped for. A much more savage parasite is needed for the fight. In the meantime, the search for a solution may be a lot closer to home. Some scientists believe that disturbed environments are more prone to invasion. In harbours and ports, dredging to improve shipping channels can destroy native marine communities that are already weakened by pollution. The building of wharves, piers and pylons gives arriving stowaways a vacant home as soon as they jump ship. In Tasmania, a new project (funded by the Natural Heritage Trust) will investigate the link between disturbed environments and the survival of the seastars. It will be interesting to see whether the best method to manage northern Pacific seastars in Australian waters may be to reduce pollution and enhance local plants and animals in estuaries. In the future, molecular biology may be harnessed to attack the seastars. Scientists could insert or change a gene in northern Pacific seastars which would castrate them or kill their young. This gene could be delivered in a bait or by a parasite. For now, it is important to learn as much as possible about the seastar in Australian waters - its feeding, reproduction, predators and movements. See also “Hunting the wild parasite” http://www.abc.net.au/science/slab/seastars/story.htm for an intersting account of research on Orchitophrya stellarm. occurs at facilities like this.